Archdiocese of Sydney Release: The Catholic Archbishop of Sydney, Most Rev. Anthony Fisher OP, delivered a strong call for the protection of religious freedom in Australia before a congregation of lawyers and lawmakers that included NSW Attorney-General, Mark Speakman MP, Opposition Leader Luke Foley MP, and Chief Justice of NSW, Tom Bathurst this week. 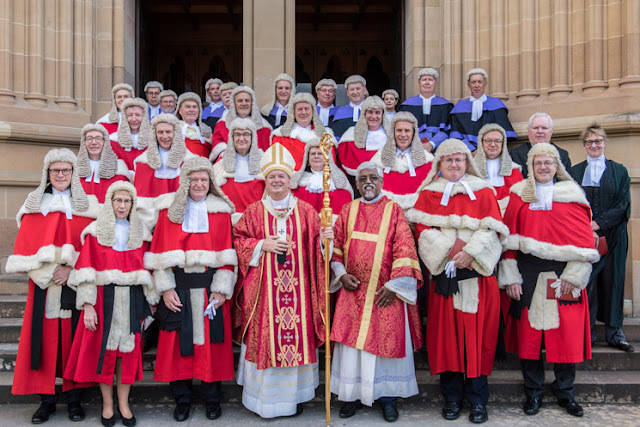 In the homily for Red Mass, which officially marked the opening of the 2018 law term, Archbishop Fisher addressed the emergence of an aggressive secularism with its "hard-edged determination to minimise the role of faith in every life and exclude it altogether from the public square." The Archbishop questioned whether people of faith would, in the future, be free in future to hold, speak and practice their beliefs. Reflecting on the Gospel reading, where Jesus exhorted His followers to render to God what was God's and to Caesar what was Caesar's, Archbishop Fisher remarked that a commitment to the 'common good' and respect for the dignity of all would be crucial in reconciling competing rights. One of the most highly acclaimed films of the past year is the biographical war drama, Hacksaw Ridge. Andrew Garfield brilliantly plays Desmond Doss, a Seventh Day Adventist Christian who served as a U.S. army medic in the Second World War but refused to bear arms. He was the first conscientious objector to receive the Medal of Honor for service above and beyond the call of duty. The film explores three tensions for Doss: the terrible war between his country and Japan, played out in the Battle of Okinawa; the conflict between himself and his fellow soldiers over whether and how he would 'have their back'; and the internal struggle between duties to God and country, mates and self. Doss reconciles these things in an extraordinary act of life-saving, and his comrades and nation come to honour his conscience. The story might occasion some reflection on freedom of religion in Australia today. For all its putative open-mindedness and despite its profound debt to Judeo-Christianity for its laws and customs, our culture is less and less tolerant of such religion. Will people in parishes, Church schools and other faith institutions, let alone in the more public square, be free in future to hold, speak and practice their beliefs? The recent change to the legal definition of marriage raised such concerns and occasioned the establishment of the Review of Religious Liberty Protections in Australia led by Hon. Phillip Ruddock. If recent trends in Australia and overseas are anything to go by, religious institutions that maintain a traditional view of marriage may well face challenges regarding their ceremonies and sacred spaces, their employment, enrolment and accommodation policies, the message they preach or curriculum they teach, their charitable status or eligibility for government grants and contracts, and so on. People of faith may find themselves the victims of vilification, 'lawfare' or disadvantage in employment, commerce, academic or professional admission, parenting or otherwise, if they are known to hold or dare to voice old-fashioned views on marriage or other matters. The recent legalisation of euthanasia in Victoria represents not only the first state-sanctioned killing of citizens in that state since the abolition of capital punishment, but also new challenges for people of traditional ethics practising healthcare or running health or aged care facilities. Will they be required, as some jurisdictions require regarding abortion, to perform, refer for or otherwise collaborate in this now-legal activity? The Royal Commission into Institutional Responses to Child Sexual Abuse drew attention to the terrible harm done to many young people, especially by clergy, religious or other church workers in the 1960s, '70s and '80s, and to the disastrous failure of some religious leaders to respond appropriately. That Commission has made many important recommendations that will be embraced by all right-thinking Australians. But as the Commissioners themselves recognised, some recommendations touch upon states of life and sacraments and might be thought to overreach the proper boundaries between state and church. Many other examples of controversies touching upon religious liberty today might be given. Each would merit long and nuanced discussion, and occasion divergent views amongst us. No one would envy the task of the Ruddock Committee, or of lawmakers, judges and practitioners, in reconciling the supposedly non-derogable right freely to hold and practice religious beliefs with other rights, responsibilities or interests. How are we to think about such matters? Christ's teaching in today's Gospel about rendering to Caesar what it Caesar's and to God what is God's (Mt 22:5-21) is an excellent starting point, but it raises questions about what properly belongs to each realm, what respecting each demands, and what to do when they overlap. Any hard and fast distinction between private and public does not seem to cut it; nor do appeals to general principles of public order and non-discrimination alone. Reflecting upon Christian Scripture and Tradition, the Second Vatican Council suggested that the purpose of law and government is to serve 'the common good', that is 'the social conditions necessary for human flourishing'. That includes reasonable access to those natural goods which contribute to human flourishing, i.e. to people's physical, emotional and spiritual wellbeing (Dignitatis humane §6). Religion is one such good (cf. John Finnis, Natural Law and Natural Rights, ch. 13). Many who are proudly Australian, or who aspire to be after fleeing persecution, treasure the generous space traditionally allowed in our law and culture for people to believe different things and practice their most deeply held beliefs. Not that Australians have any monopoly on such respectfulness: international law insists that such liberties precede the state, are positive rights not just exemptions or concessions to minorities, and must be respected and promoted by law-makers and keepers (e.g. Article 18 of the International Covenant on Civil and Political Rights). Whether through constitutional or positive law, through public education and dialogue, through advancing concepts of 'fair go' and neighbourliness, or in other ways, every community needs mechanisms to safeguard the rights of citizens and resolve conflicts between them. I would say that Australia has mostly been good at this, if not always or in all respects. The militant secularism in the air at the moment, like the colonialism, sectarianism, racism and sexism in the air at other times, threatens to unravel Australian respectfulness in religious matters and historic balances between Church and state. It's not just the annual barneys over whether councils can wish people a Merry Christmas on their street banners or state school choirs sing carols. Rather, there is now a more hard-edged determination to minimise the role of faith in every life and exclude it altogether from the public square. The pressure is on to eradicate Judeo-Christian ideas such as the sanctity of life and love from our laws and customs, to inoculate people to faith or make them embarrassed or secretive about it, and to enforce a kind of practical agnosticism on the whole community. There is no room for a Desmond Doss in such a world. Ninety years ago G.K. Chesterton presciently observed that Thomas More, whom he saw as a martyr for conscience and religious liberty, "is more important at this moment than at any moment in his life... but he is not quite so important as he will be in about a hundred years time." (A Turning Point in History,1929). Welcome to St Mary's Cathedral for the annual Red Mass at the opening of the new law term. Our law-makers, judges, practitioners, teachers and students play an essential role in our community, and rightly seek a higher wisdom - the wisdom of Solomon - and a higher inspiration - that of the Holy Spirit - to serve true justice and mercy. I acknowledge the concelebrating clergy, including Fr Peter Joseph, chaplain to the St Thomas More Society. I thank all the members of that Society for assisting in organising this occasion. And other current or past MPs. Other current and retired judges and judicial officers. The Dean of the School of Law in the University of Notre Dame, Prof. Michael Quinlan, and law teachers and students. To anyone associated with the law, a very warm welcome.